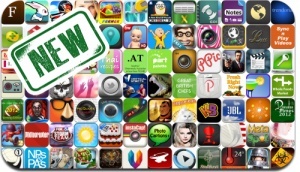 iOSnoops is constantly on the lookout for new apps, and here are 84 iPhone, iPad and iPod touch apps recently released. This new apps alert includes Fieldrunners 2, SuperFarmers, Pocket Minions, Office Jerk Summer Games Edition, Can’t Say That!, Again Car Drift Race, RabbitJourney, Mutant Roadkill, Arms Cartel Global, Mystery Valley, and many others. CompleteNote – take notes quickly and easily!